You've heard me reference my homemade laundry detergent before. Many of you have asked for my recipe. Your wish is (finally) my command. 1 bar of Ivory (or Fels Naptha) soap. Utilizing these 3 ingredients, you can make a dry or a liquid version. I have not yet tried the liquid version, but intend to in the future. I have been using the dry for two years now with excellent results. Add grated soap to the Borax and Washing Soda. You can make as big a batch as you like and add it to a suitable container. You use 1-2 tbs of the mix for each load of laundry. The soap will not suds a lot. Don’t expect it to. 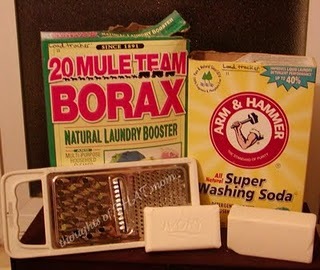 You can use either ½ cup or 1 cup of the Borax and Washing Soda. The amount you use will be totally dependent on your needs. I usually use a mixture with ½ cup each, but I keep a mixture with 1 cup each in a mason jar in my big container for heavier loads (like when my son walks in the door covered in mud). If you don’t want to bother with 2 separate mixes, you can always just add a little extra Borax to the load. It is a natural laundry booster that many use even with "regular" laundry detergent. Yes. You really only use 1-2 tbs with each load. I know it seems like an incredibly small amount. But your clothes WILL be clean. I promise. If you have hard water, you might need to use a little extra. I would start with 1 tbs & increase to as much as 3 or 4 tbs per load of laundry if necessary. If you have soft water because of a water softener, you probably won't want to use over 1 tbs; but definitely not over 2 tbs. When I do the liquid version (sometime in the ever-elusive future), I will get back to you and let you know how it goes. You will save more money if you use the liquid version, but for me, I needed convenience. I’m still saving money by utilizing the dry version, just not as much. If you try it, please let me know how it goes for you. If you have any questions, post it here, e-mail me, or talk to me on Facebook or Twitter! So I love the new mom tip with making soap. Can I use that in my front load washer. If it makes lots of suds I know it's not good. So I guess I'm asking does the soap make lots of suds. in fact it doesn't suds up at all. Cool! I gotta try it now. you should ! It's easy! What Vanessa said! However...if you have a water softener, you'll want to start with only 1 tbs. I missed it Amy. Did the issue of hard water come up? I did address the issue with hard water. You may have to use a little more than the 1-2 tbs that's recommended if you have hard water (like we do here in Vegas). Good to know, Lyndsay. Thanks! I've hesitate on the liquid only because I'd need hubby here to help with the lifting...and I never seem to make my next batch when he's around! If you wanted to keep it more natural, you could either double the Borax in the dry mix or just add a little extra Borax to each load. My husband works outside and sweats a lot. Will it remove odors too? I have been using the Liquid version for the past year. I average a load a day and that 5 gallon (that makes 10 gallons of soap) can last my family of 4 up to 8 months. It takes about 20 minutes to make but $3 is a great alternative to the $16.99 Tide that I would buy on sale every 2 months. You can do this regardless of whether you use "regular" laundry detergent or a homemade version. @Geri: You're right! It DEFINITELY is a HUGE savings over buying store-bought detergent; regardless of which version you buy! I've been using the detergent for about four months now. I love it! I'm going to make it this weekened. But I am daring and will be tring the liquid. Do you need the full recipe for that, Hope, or did you find it already? I found one that looks pretty easy to do with the same ingredients. I'd love to compare to the one you have. Can I get the recipe for the liquid?